← Deadlines, bottomlines, stress … and letting go! Everything in my life always comes back to horses. It’s not just that they’ve been a passion, and it’s not just the physical presence of the little herd that lives in the back. It’s the lessons they’ve taught me that I apply to the rest of my life. I have long credit my leadership skills at work to the lessons I’ve learned from working with horses. It’s also my experiences in life that lead me to understand horses even better. I am living through one of those now. 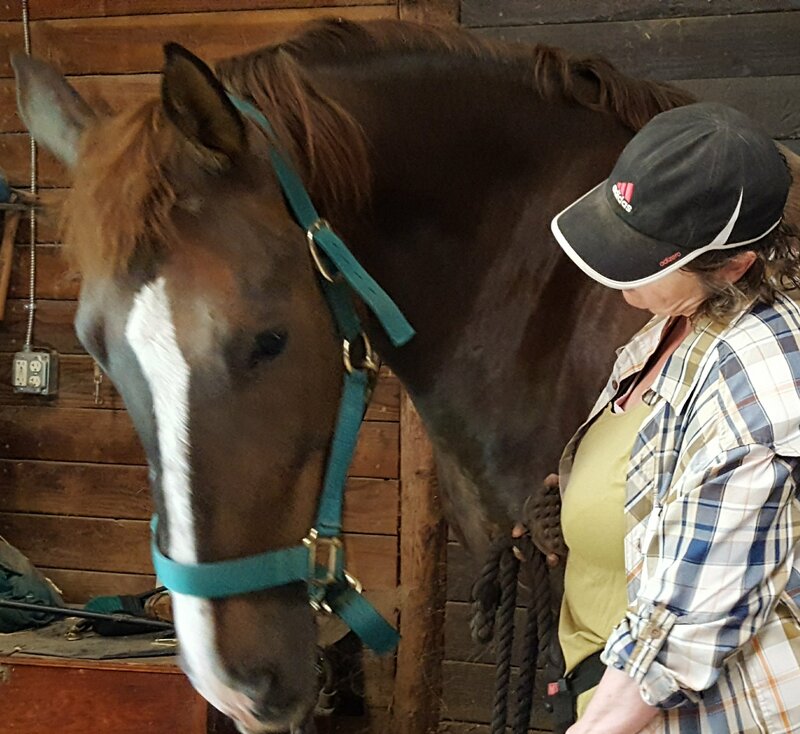 Over the decades, I have worked with a lot of horses who came to me sour, anxious, or shut down. I am always sad to meet one of these horses, because none of that is a normal state for any horse. Like people, they have a variety of personalities – you will find some who are more assertive, some who are more sensitive, and some who are laid back. Those are all normal variations in horse personalities. But neither humans nor horses arrive at sour, anxious, or shut down without continued negative experiences. Although these horses make me sad, they have been some of the most rewarding experiences I’ve ever had. Watching them go from negative reactions in our interactions, or no reaction at all, to eventually enjoying those interactions is an amazing journey. It always starts with some moment where the negative or non-reaction is replaced by a puzzled look. Whatever they are anticipating, whether pain or fear, doesn’t come and they are initially confused by this. Eventually the questioning reaction begins to be replaced by tentative moves into positive participation. The first time one of these horses greets me with a happy whicker I always get a little teary! What is it that brings these horses around? The key is praise. I have long been told that horses don’t understand my words or my tone. Science is slowly proving that they do – and even recently is showing that horses can read our facial expressions. I have long found that my voice and kind words have a healing effect on these horses. No doubt that body language and overall mood also register – but I learned very young, from my theatrical mother, that how you use your voice can affect how you begin to feel and move. So, speaking softly and positively registers throughout your body – and horses are nothing if not reactive to the feelings of those around them. We all know that praise can make someone feel good. Who doesn’t like being told that they have done something good? But, with these horses, I believe there is more than just feeling good about praise that brings them out from under their dark cloud. I believe there is another piece of recent behavioral study that is at work here – gratitude. Studies are showing the people who feel grateful are generally more positive and happy. Since I firmly believe that animals share many of our emotions (which science is also slowly proving), why wouldn’t a horse who lived in fear or pain begin to feel gratitude when that cloud is lifted? As I said, working with these horses, and watching them bloom, has always been rewarding for me. But recent experiences have given me a new appreciation of what the experience is like for these horses. For more than a year I have struggled at work. I have been bullied, belittled, yelled at, and taunted by my boss. I have been given a workload that was impossible, but have worked hard to accomplish it. Yet, no amount of effort has been good enough. I have tried every approach I can think of to accommodate his ‘leadership style’, but nothing has been good enough. By this spring, I was having trouble sleeping, I suffered persistent heartburn no matter how mild and small the meal, and I’d get home dragging at the end of the day. I had moments of sour temper, some of anxiety, but mostly was finding myself shutting down. Then the opportunity came to try a new job, with a new boss. I knew it would bring relief, but I was not prepared for the scope of the change it caused. The relief of not facing the daily potential for bullying was nearly instantaneous. This is where I have the advantage over a horse – I knew that the change removed the source of my torment. What I could not foresee was the reaction from people in the department I have joined. These first few weeks have been regularly peppered with people telling me how glad they are that I have joined the team. It’s not just a reaction to how nice they think I am, but specifically the value they feel I bring. These aren’t necessarily strangers, but my working relationship with most has been casual, so the reaction has been a pleasant surprise. Yesterday it culminated when a new employee, now under my supervision, said that several people have told her how lucky she is to have me as her supervisor and how much she’ll learn from me. On the train home, I began to think of all of those horses whose lives I’ve turned around, and I began to tear up at thinking what it must have been like for them. My whole body feels better. I smile most of the time. I feel physically as though a huge weight has been removed from my shoulders. In thinking about it, I realized that while the praise and support have made me feel good about myself again, it is the gratitude at being taken out of that situation that has had the biggest effect on my own improvement. Someone has given me this opportunity to interact with people who appreciate me; to face new challenges knowing that I will not be punished for making a mistake; to let me once again shine with my innate personality, no longer under an oppressive cloud. I now understand the internal feelings that were manifested in the outward behavior of the horses I’ve been able to take from shutdown to shining. Be good to your horses … and to anyone over whom you hold any power! This entry was posted in My Journey, Thinking Out Loud and tagged abuse of power, gratitude, job changes, leadership, learned helplessness, power, praise. Bookmark the permalink. This is a lovely post. I am SOOOOO glad you have a new job and have left the bullying and belittling behind. The horses who have come to you are lucky. I think that there are also children who are discouraged ( never getting recognition or praise) that end up acting out and behaving badly and then they get the wrong sort of attention. All the best to you going forward. Thank you so much, Anne. You are very right about children … we all function so much more healthfully with positive social interaction.